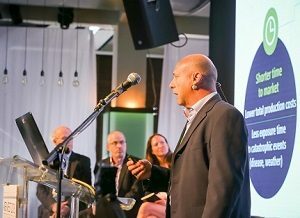 As the judges look on, AquiNovo CEO Nissim Chen presents during the Best Israeli Agtech Company competition at AgriVest 2018. AquiNovo took 2nd place. CEOCFO: Mr. Chen, when is the concept behind AquiNovo? Mr. Chen: AquiNovo was established to meet the ever-growing demand for fish. As marine sources are being depleted, increasing amounts of fish are provided by the aquaculture industry that has grown significantly in the last 30 years. Actually, since 2014, aquaculture provides over fifty percent of fish consumed by humans. However this tremendous growth comes with pressing challenges, the key of which is the need to sustainable increase fish yield. CEOCFO: Would you explain how the [AquiNovo technology] works? Mr. Chen: AquiNovo’s technology is based on proprietary short peptides, which are basically a truncated, modified forms of naturally occurring peptides in the fish. The activities of these peptides in fish are employed to enhance fish growth when given externally. Read the full interview in CEOCFO Magazine (PDF).